This is my first WIP (work in progress) after my return from Romania and my second project from Norah's book: Knitting Nature. The first project was Droplet Hat. The hat for a swap on Ravelry but I am making this lovely tank for myself. 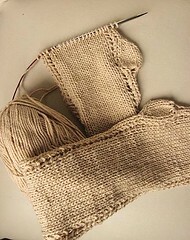 I am using a Turkish yarn from Linate Okiteks, CotoLin Gold: 50% cotton and 50% acrylic. It was a true bargain as it's a discontinued yarn and the seller told me it was the last batch. I just adore the color: yellow peach, very close to the skin color. My gauge/tension is 20 sts per 4'' with US 7/4.5 mm needle and I cast on for the smallest size. My nickel plated KnitPicks interchangeble circular needles are perfect for this type of yarn. Oh yes that one is on my list too! I wanted to say thanks to your comment on my Urban Aran sweater on the blog the other day. I didn't know how to email you back. I like how it came out and it's really ok with the red hair, huh? It was a gamble but I like it. I'm waiting to see your beautiful project done! this is one of my favourites!